In the midst of planning Craft Book Month, some job changes and lots of sewing, it barely occurred to me that it's almost time for . . .
Sewing Summit! Looking forward to meeting up again with some blogging friends (and my fab roommates), visiting a new-to-me city and maybe even sneaking in some late-night sewing. What I didn't get the chance to tell you is that I'm teaching! My session will be about my creative journey, and making the switch from a full-time job to crafting and writing as a career. Yes, sometimes you literally need the safety net to be yanked out from under you. If you're like me, branching out into your own creative business is a little scary. But, what I can tell you from someone else who is on the journey, is that there is life after disappointment. And your biggest creative dream of all is probably not as far-fetched as you think it might be! 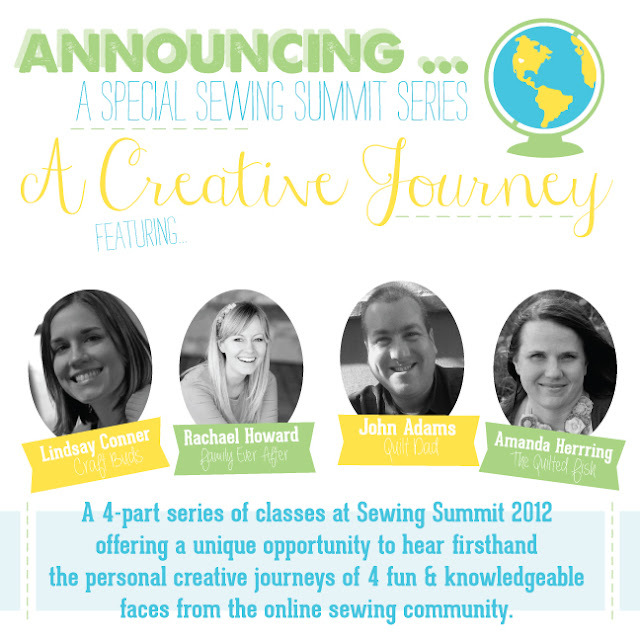 The Sewing Summit class schedule was announced yesterday, and it looks awesome! I am going to try to mix up my schedule with some hands-on sewing classes (maxi skirt, anyone?) as well as some lecture classes (creative fabric selection and photography). Hope to see you there, but if you aren't attending, I'll come back with lots of pictures and a full recap! I'm in the UK so I won't be there but I'm looking forward to hearing all about it! Hope we get to meet even if I don't make it into your class. I'm excited to see the side stuff falling into place and making it feel so REAL. Very cool! I am still picking my classes and can't wait to register. And then of course attend! Y'all are going to have such a great time! I can't wait to hear all about it.